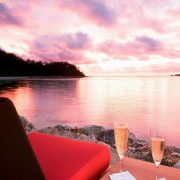 This Ultimate Romance in Samoa & Fiji Vacation is flexible and can be tailored to suit your needs. Pack your bags and head to your nearest Fiji international hub. You’ll catch an overnight flight to Nadi, Fiji. On your way, you’ll cross the date line and lose 1 day. You’ll land in Nadi early in the morning before hopping on a short international flight to Apia, Samoa. 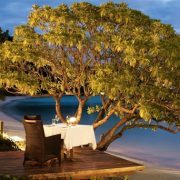 A 90 minute ground transfer will take you to Seabreeze Resort Samoa to begin you amazing Romantic Vacation. 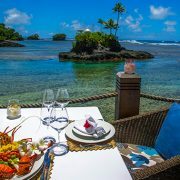 Spend 5 nights at an award winning, luxury and boutique, adults only resort nestled in a private cove on the south-eastern coast of Upolu. 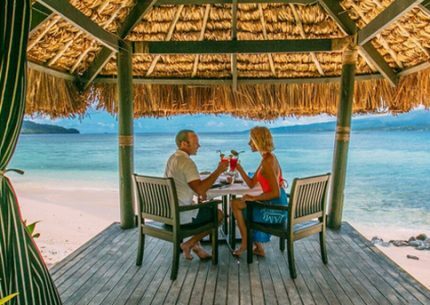 Seabreeze Resort Samoa is set in a secluded location at Paradise Cove on an exclusive and unspoiled white sandy beach, making it the perfect choice for anyone wanting to escape the hustle and bustle of modern life, and to reconnect with the one they love. 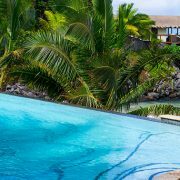 Located 90 minutes from the Faleolo International Airport, and an hour from Apia, the resort has all the facilities one expects of a luxury resort. 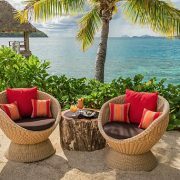 From the bespoke Villa accommodation to the private beach to the Waterfront Restaurant & Bar, Seabreeze offers guests a truly unforgettable tropical vacation. Along with the amazing location, the award winning Waterfront Restaurant & Bar offers a unique dining experience in a setting that overlooks Paradise Cove and the ocean beyond. The gorgeous outlook is coupled with a selection of mouth-watering menu options to choose from. Relax by the pool and enjoy a cocktail from Paulinis Pool Bar, or treat yourself to a relaxing massage or facial to rejuvenate your skin and body, and revitalize your soul. The lagoon is rich with marine life so take time to explore the underwater world through a bit of snorkeling or kayaking. If you’d like to explore further, the resort has rental cars available, or they can assist you with booking a bespoke guided tour. There are 11 well-appointed Villas with five categories to choose from starting from the Ocean View Villas right up to the Honeymoon Point House. Each Villa is constructed with the tropics in mind. There are high ceilings for good airflow, large outdoor living spaces, ceiling fans and air conditioning, luxury bathrooms, premium bedding along with the necessities including tea & coffee making facilities, a minibar fridge, double ham-mocks or daybeds to relax in. Your stay includes: A la carte breakfast daily, personalized guest orientation on first morning of arrival, complimentary use of glass bottom kayaks, & snorkeling gear, free cultural afternoon—Fridays, complimentary a la cartemini bar replenished daily for items consumed (beers, wine, soft drinks, water, snacks), use of guest library, complimentary use of smart phones during stay, clients to top up with credit values (bond applies), complimentary food platter in room for arrivals after 9pm and before 7am and nightly turn-down service. Take a full day guided private tour of Savai’i with your personal chef! Savai’i is a paradise on Earth where you’ll get real insight into the traditional Samoan way of life. Time in Samoa runs slow, but in Savai’i it’s even slower. Samoa’s largest island is known for its pristine scenery and offers natural gens aplenty: lush rainforest teeming with bird-life, secluded white sand beaches, turquoise lagoons, lava fields, thundering waterfalls, archaeological sites, caves and spectacular blowholes. Your food-focused tour provides a unique opportunity to explore Samoa’s food culture and beautiful landscapes. The Chef will bring along organically grown seasonal fruit and vegetables as well as fresh seafood – the ingredients for lunch later on in the tour. 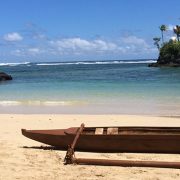 Your tour starts with an early morning transfer from your hotel to the ferry terminal, where you will board Lady Samoa for a trip across the Apolima Strait to the “Big Island” of Savai’i. Then it’s on to visit some of Savai’i’s amazing locations. At one of your chosen locations, the chef will prepare your lunch fresh on-site as you explore the grounds. Site options include: Blowholes, Saleaula Lava Fields & LMS church, the turtle sanctuary, where you can swim with the turtles, Afa Au’au Waterfall, Amoa Resorts Pier, Lusias Lagoon, and Manase Beach. Just let your Destination Specialist know which sites you want to see most and your tour guide will work to fit it all in! *Note: You can choose up to 3 sites to explore. Due to the location of the Blowholes, time will be limited and you may only see two other sites when booked on the Day Tour. A 4-site visit can be accomplished if you forgo the fresh cooked lunch and opt for a pre-packed lunch. After an amazing day on Savai’I, you’ll take the ferry and private transfer back to your hotel and arrive back at about 6pm. Important note: a good level of fitness, health and basic swimming is required. Must take extra precaution as some sites can be slippery. Tour is not recommended for those who have walking difficulties or other health issues. The Seabreeze Resort offers personalized tours of Uplou. Just sit down and have a chat with the resort manager. He will put a personalized itinerary together to ensure you and your love have a wonderful time in Samoa! Transfer from your resort to the Faleolo airport and take a short International Flight to Nadi, Fiji. Here you will be transferred to Port Denarau where you will board a Catamaran for your trip to Likuliku in the Mamanuca Islands. 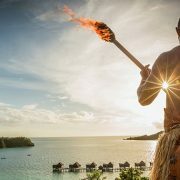 Spend 3 amazing nights at Fiji’s most unique ‘adults only’ luxury escape, a special place designed with integrity to cultural values, traditional designs and architecture, embraced by the renowned warmth of the Fijian people. From the water it looks like an ancient village, so traditional is the style. 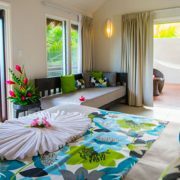 Located 16 miles from Nadi International Airport, this luxury resort is set among tropical gardens, steps from the beach and lagoons. 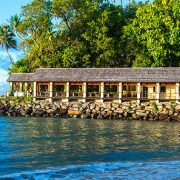 The beating heart of the Resort is a magnificent building in the design of a Fijian canoe house. 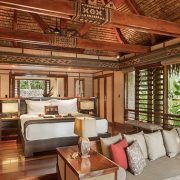 Surrounded by sprawling ceilings, hand-woven thatch and an exotic mix of natural materials and modern elements, Likuliku embodies the richness of an ancient culture with vibrant touches of present-day luxury. All Bures feature ocean views, air conditioning, fridge, plunger coffee and tea facilities, mini-bars on request, telephones, music systems, flat-screen monitors with DVD players (select Bures only), free WiFi, iron, hair dryer, robes, separate bathroom including an outdoor shower (rinsing-only shower in select Bures), bathing pavilion with bath (select Bures only), lounge areas, overhead fans, spacious decks and a private plunge pool (select Bures only). All comprise one (1) king size bed suitable for a maximum of two (2) adults only. Due to the nature of the experience being offered , there are no televisions in the Bures, however, there is an entertainment lounge in the Central Facility featuring a satellite TV. The Resort has excursions and adventures to fill just about every hour of every day including: scuba diving, fishing ranging from hand line to sport fishing, water skiing, village tours and dolphin spotting. 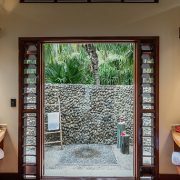 A gymnasium complimentary to guests is available as well as a spa specializing in traditional and local therapies utilizing the beautiful products of “Pure Fiji.” Complimentary Wireless “hotspots” and two internet desks are available in the Central Facility as well as a Boutique offering guests unique fashion and accessories along with local and traditional arts and crafts. Likuliku offers a daily-changing schedule of activities, including complimentary non-motorized watersports such as stand-up paddle boarding, kayaking, sailing and wind surfing, plus complimentary snorkeling equipment. In addition, there is a myriad of land and sea tours and activities available (may be at additional cost) in and around the surrounding Mamanuca Islands. The islands of the Mamanucas are rich with coral reefs and a vast variety of amazing tropical fish. Likuliku Lagoon and Malolo Island are surrounded by a fringing coral reef making snorkeling ideal. If you want to venture further afield and explore other snorkel sites, there are daily trips to various sites nearby and sometimes you may even end up in an undiscovered part of the islands, seeing amazing marine life for the first time. Within the immediate area surrounding Likuliku and Malolo Island, there is a marine reserve where fishing is strictly forbidden. However, there are a variety of fishing excursions to areas where keen anglers can troll for tuna or perhaps a Giant Trevally. Also, Dog Tooth Tuna, Mahi Mahi, Wahoo, Rainbow Runner, Barracuda, Coral Trout, Scad and Billfish are just some of the fish that swim the waters. There are several walking trails varying in length and difficulty from the resort. The walks can include Jona’s Lookout with magnificent views over the resort and island waters, the Ridge Track to Naroba Point and also the walk along nearby Naivaka Beach. Here you will experience how the indigenous land owners live at the local villages of Yaro and Solevu by taking the “Shell Village Tour." Solevu is also the home of the Paramount Chief of the Mamanuca Islands. Perhaps experience a traditional Fijian church service available to guests each Sunday. Fiji is a multi-religious country represented by all major religions. The majority of Fijians are Christians and on Malolo Island there is a Methodist service each Sunday at Yaro Village where the highlight is to experience the exquisite voices of the local Fijian choir. Often the best time to be on the water is in the early morning before the wind picks up and it is certainly the best time for an early morning island hopping trip. Take a trip past Castaway Island, Mana Island, Matamanoa Island and finally MonuRiki Island where we stop for a swim, snorkel and walk along the beach. MonuRiki Island is one of the most stunningly beautiful islands in the Mamanucas and is where the famous “Cast Away” movie with Tom Hanks was filmed. The trip then heads north around Monu Island, west round the top of Yanuya Island, past Tokoriki Island before turning south for the return trip past Tavua Island and finally stopping at Mana Sand Bank for another swim and snorkel, before heading back for a late breakfast at the resort. Malolo is referred to by the local Fijians as “Na Siga e dromu I Malolo.” Translated this means “the place where the sun comes to rest.” The sunsets from Likuliku can be quite magnificent, and what better way to enjoy the scene than from one of our sunset cruises whilst sipping a glass of sparkling wine, enjoying Chef’s canapés and listening to the sounds of one of our Likuliku serenaders as you sail around the island. A very special activity but unfortunately one that isn’t always available due to tides and prevailing weather conditions, is a Picnic Lunch to a local Sandbank or private island beach. These Sandbanks are only accessible at mid to high tide and are new islands in the making. The surrounding waters are pristine and clear and there is great swimming and snorkeling. The activities team will set you up with your picnic lunch and umbrellas for shade. Close to the Resort are some of the world’s most famous surf breaks found along the southern part of the Malolo Barrier Reef. 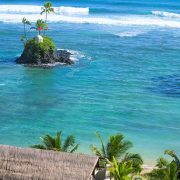 We offer surf tours to Cloudbreak (home to the Fiji Pro annual surfing championships), Wilkes Passage, Desperation and Restaurants. On Friday nights be entertained by members of staff who will perform the traditional Meke (dance). Here you will experience traditional stories through dance and song. This is followed by dinner of the traditional Lovo (earth oven feast) and South Pacific BBQ. The drinking of Kava is an important Fijian tradition. On Monday evenings, join the activities team for a traditional Kava ceremony at Masima Bar. Learn about the origins of Kava, the plant and its attributes along with the protocols surrounding the ceremony itself. The Dive Centre is operated by Subsurface Fiji, a PADI 5 Star IDC. A short boat ride away and just below the surface is another world. A world of vivid turquoise waters abundant with beautiful hard and soft corals, teeming with an amazing variety of colorful reef fish. Choose a relaxing dive in the calm inner reef waters or explore the deeper ocean side Mamanuca barrier reef where dolphins, manta rays, turtles and large pelagic fish are your dive companions. Certified divers have a choice of 44 dive sites in the Mamanuca Islands. Expect to see caves, pinnacles, walls, a crashed B26 Bomber from WW2, a ship wreck and even a shark encounter dive at the world- famous ‘Supermarket’ dive site. Add in an abundance of tropical fish, large pelagic fish, and the colorful soft corals that Fiji is famous for and you will want to keep exploring these magnificent reefs. Dive trips depart daily. PADI DISCOVER SCUBA DIVING: Half-day introduction to scuba diving. Learn the scuba basics in the pool and then it’s off to dive the world famous reefs with the guidance of your dive instructor. On your final day, you will board a boat at Likuliku as the staff sings their farewell. Your boat transfer will take you to Port Denarau where you will meet your transfer to the Nadi Airport. Then you will board your International Flight to Los Angeles or San Francisco before taking your final flight home.